Dark seasonal streaks on slopes near the Martian equator may be a sign of flowing salt water on Mars, liquid runoff that melts and evaporates during the planet's warmer months, scientists say. NASA's Mars Reconnaissance Orbiter spotted the dark streaks on Mars as they formed and grew in the planet's late spring and summer seasons, when the Martian equatorial region receives the most sunlight. The streaks then faded the next season as cooler temperatures prevailed. "Now we've found them in equatorial regions," McEwen told SPACE.com. "This is more surprising, given peoples' expectations that the equatorial region was completely dry. It suggests there may be much more water in the near-surface crust than we imagined before." Map of the confirmed locations of dark streaks, or recurring slope lineae, on Mars. The dark, narrow lines were observed on long, steep slopes in Valles Marineris, an extensive series of canyons located along the equator of Mars. In some cases, the fingerlike streaks stretched nearly 3,700 feet (1,130 meters). The discovery is detailed in the Dec. 10 edition of the journal Nature Geoscience and will be discussed today at the annual American Geophysical Union meeting in San Francisco. Researchers are still puzzling over the likely cause of these tantalizing streaks, but McEwen said they could be produced by the melting and subsequent evaporation of frozen salty water trapped deep in the planet's crust. But, much is still unknown about whether the streaks are actually caused by liquid water, and if so, where the water is coming from. So far, researchers say the best explanation is that the liquid is a salty, or briny, solution. Salty water can stay liquid at colder temperatures, which means brines could conceivably flow on the frigid surface of Mars. "Water should be rapidly evaporating, so it's difficult to explain long flows unless it's sufficiently salty water," McEwen said. Also, Mars has a very dry atmosphere, which makes it unlikely that freshwater flows on the surface of the planet, said Vincent Chevrier, a planetary scientist at the University of Arkansas in Fayetteville, who was not involved with the new study. "Water has a tendency to evaporate very quickly when it's exposed at the surface," he told SPACE.com. Last year, Chevrier led a team of researchers who investigated the seasonal flows found on Martian slopes at mid-latitudes. 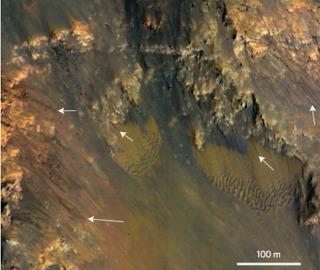 The scientists modeled the behaviors of different brine mixtures to see if any could exhibit similar characteristics to what had been observed on Mars. Chevrier and his colleagues found that calcium chloride did not immediately evaporate, and left behind some liquid that could create the types of streaks seen on the Red Planet. Others have attempted to explain the seasonal markings with "non-liquid" solutions, such as wind patterns, but so far none have seemed plausible, McEwen said. "So far, there aren’t any good dry hypotheses," he said. "There are some possibilities, and we keep them open as working hypotheses, but no one has been able to come up with a detailed model that makes sense." While scientists have long viewed present-day Mars as a dry and dusty world, evidence abounds that water once flowed across much of the planet billions of years ago. Frozen water has been detected near the planet's surface at middle-to-high latitudes, but so far, no definitive evidence of liquid water has been found. The new findings raise intriguing questions about the possibility of liquid water on present-day Mars, which has ties to the ongoing search for life on the Red Planet. "It's certainly very surprising to me that this is happening on Mars today," McEwen said. "If it is water, that really changes our thinking of the planet's water cycle and habitability." On Earth, life teems wherever liquid water is found, which means a wetter Mars could have tantalizing prospects for hosting extraterrestrial life. "Earth is loaded with liquid water —it's a liquid water paradise," Chevrier said. "I'm not saying this means life is possible on Mars, but this is a good small step."